Incentive travel is proven to be one of the most successful motivators of employees with a high ROI, but before entering into a relationship with an incentive travel company, it is important to consider the company’s stability, reputation, and relationships. How long have you been in business? Have operations been continuous throughout? Has the company (in any iteration) ever filed for bankruptcy? Can you provide 3-5 references of current clients? You will also want to do your own due diligence and speak with former clients and other business references. 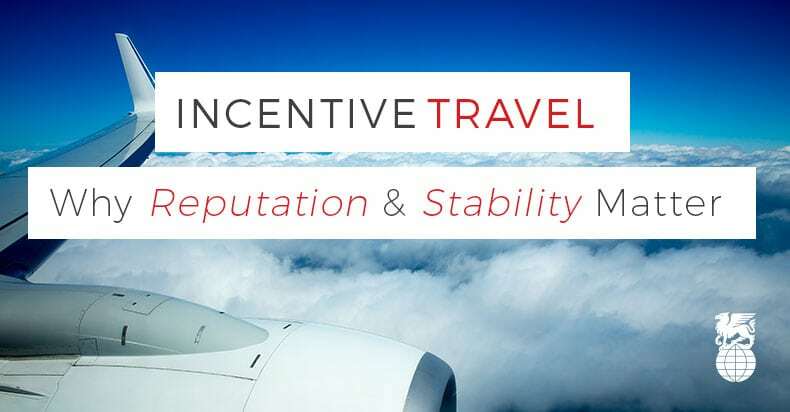 A meeting and incentive travel company with a strong industry reputation will help ensure you get the best value and ROI for your travel program. Plus, they can often secure added perks like food and beverage credits or VIP status that are not available to less established firms. Even in the B2B world, people prefer working with people they “like”. Check with the Group Sales Managers at hotels under consideration to ask about the firm’s professionalism. He or she won’t spill all the beans, but if you are inquiring about a company they don’t enjoy working with, you will know it. In 5 minutes or less, your average 10-year-old can research consumer reviews, meeting space and rates for any hotel or resort in the world. However, the average 10-year-old, and even the most seasoned in-house meeting planners, don’t have the aggregate buying power and relationships that are necessary to protect your investment. If you need to change your dates, or add a hotel room for your CEO when the hotel is sold out – who is the hotel more likely to make special allowances for? An in-house meeting planner with a single contract, or a company that supports their brand and their property year after year with millions of dollars? “Waivers and favors” are not written into any contract, but they are critical to ensuring a successful program. Below are some of the most common “disruptions” to an incentive trip. Make sure your travel partner has plans A, B and C for each. For more information about incentive travel or to start planning your incentive travel program, visit www.brownellincentivetravel.com.